The BUG (Back-Up Gun) match is a home-grown sport at Pima Pistol that’s was started in 2010! It’s a chance to shoot that small handgun you usually carry for self defense against the clock! There are no minimum caliber requirements to shoot the BUG match and a lot fewer rules and procedures to learn than other popular competitions. Guns must be small enough to fit into a 5.25″ x 7″ box with a magazine inserted (basically smaller than a Glock 19/23). Holsters are not required*, but dress so that you could carry your pistol in your pocket or tucked into your waistband if you don’t have one. You may also need one extra magazine or reloader (you’re free to reload with loose rounds out of your pocket if necessary). * For safety, BUG stages start with the handgun safely staged or held at low ready. 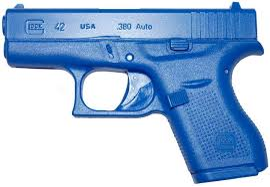 Sometimes drawing the gun is simulated using a blue gun to exchange for the pre-staged firearm. There will be 4 stages requiring no more than 10 rounds each to complete and matches start at 9am year round (please be there by 8:45 to sign in). The smallest gun you carry! Anything, even a .22, can enter. The gun must fit in one of the divisions listed above. Holsters are optional but it helps to dress so that you can tuck a blue gun into a pocket or waistband.